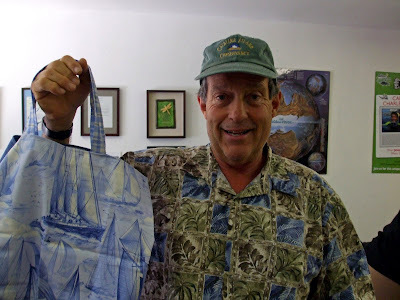 In this post, I began a string of what will be many posts about the plastic in our oceans. Truly, we should all be concerned about this. The problem is horrific and only getting worse. The Algalita Marine Research Foundation (AMRF) is a non-profit marine research and education organization that is working tirelessly to protect the marine environment and its watersheds. They are doing this through research, education and restoration. You can also watch the talk he did for TED last year here. He was also on David Letterman last night. Over the past couple of months, I have been in contact with the Algalita Foundation and have signed up for their Ship-2-Shore program. This is a program where a school or class follows an Algalita voyage to one of the GYRES (there are 5, read about them here) and your students can ask questions to the ship's crew while they are at sea. How cool is that? Are you a teacher? Sign up! To learn more about the Ship-2-Shore program and to register your school, go here. 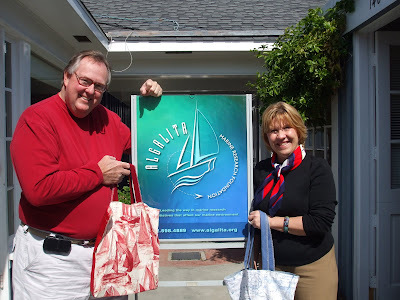 Of course, I could not resist sending the Algalita Foundation a box of bags. Here is Captain Moore with his bag. . .
And the next photo is of AMRF Executive Director, Marieta Francis and AMRF President, Bill Francis with their Green Bag Lady Bags. . . This is a topic that is near and dear to my heart. To solve a temporary problem by creating a permanent one is so ridiculous! This insanity must stop! Captain Moore and the Green Bag Lady are part of the solution. Thank you for all you do! Everyone should know about this. I love those ship designs.